This MD-1008A metal detector is a great learning metal detector for kids to use. The signal increases in volume as targets get closer. It has function of discrimination control, able to eliminates iron and most unwanted items. Waterproof dial: you can use metal detectors in shallow water. You can find lost coins, gold and other metal objects. It is universal and easy to use. 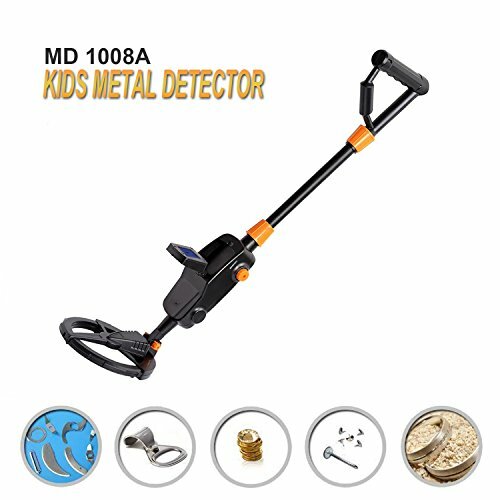 Newly kids metal detector for cultivating an exciting interest and hobby. Applications: Science Education, Parents-Kids Activity, Simple Metal Detection. High sensitivity and easy operation, It can be used to find missing or lost coins, pieces of gold, jewelry and other metal objects. Also, you may find lots of bottle caps, metal pull tabs and foil wrap. Ideal gift for children, kids toy treasure hunter. Lightweight, ergonomic design for easy, comfortable handling. Enjoy yourselves! Features: 1. LCD display.2. Light weight and easy operation.3. Sensitive Control. If you have any questions about this product by PiscatorZone, contact us by completing and submitting the form below. If you are looking for a specif part number, please include it with your message. 2wayz All Metal Body Garden Hose Splitter. Newly Upgraded (2017): 100% Secured, Bolted & Threaded. Easy Grip, Smooth Long Handles y Valve. Bonus Included: 10 Washers.